The SWIG event on 13 October was a visit from Chris Mason who came to talk about Swifts and how we can help to protect these amazing birds which are still coming back to Somerton every year from sub-Saharan Africa. It was a welcome reminder of our glorious summer days on a dark November evening! Some years ago a friend told me about a nesting colony of 7 or 8 pairs of swifts that was at risk. The old barn where the birds had nested for decades was to be converted into a house. I contacted a well-known local ornithologist for advice, and he arranged with the builders for the holes to be left. Nine summers later swifts are still nesting there. The owners of the new house love sharing their property with the swifts and look forward to their annual return. At the Kirtlington home of Chris and Ruth Powles who created nest places for Swifts during recent renovation work. Two young Swifts fledged successfully in 2012That event sparked my special interest in swifts. I visited the Museum of Natural History in Oxford to see the swifts nesting there, and I started to take careful note of what was happening in my own village of Kirtlington. I knew that the swift population in Britain was declining, and I realised that in Kirtlington numbers were critically low – perhaps only 4 or 5 pairs in all. I took note of which properties they used for nesting; during the last 8 years or so since, all these buildings have undergone (or will shortly undergo) changes affecting swift nest sites. When talking to the owners they were always willing to help, either by leaving the nest holes alone, or by putting up nest boxes instead. Buildings constantly require work especially the older ones so favoured by swifts. No wonder swift numbers are going down! 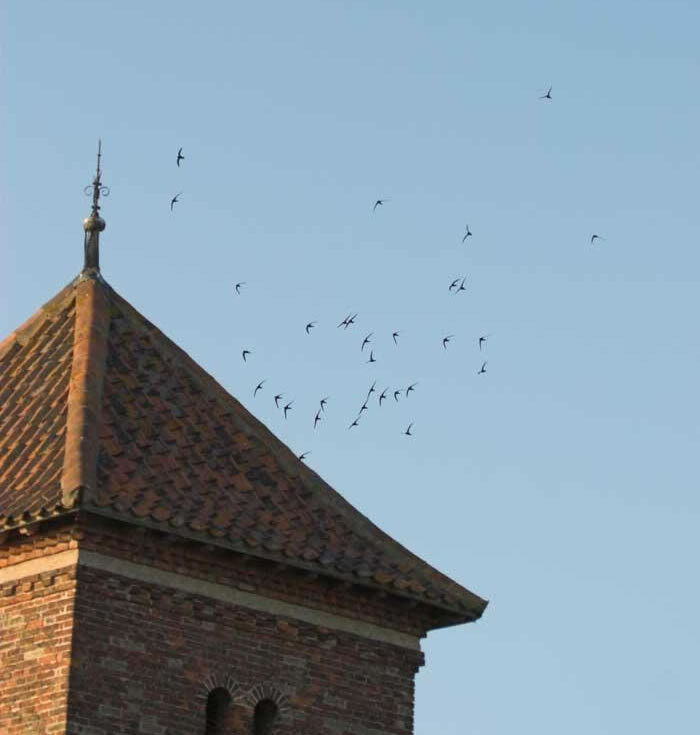 On the brighter side, thanks to Action for Swifts, we have swift nest boxes in the local church tower, and several home owners have put up nest boxes too. So in Kirtlington at least swifts are not short of nest places. At the same time I knew that the Cherwell District Council (Oxfordshire) had made a commitment to ‘identify and protect important Swift nest sites’ in the district. So I met with the Biodiversity and Countryside Officer and together we agreed how this rather ambitious hope might be realised. I identified buildings in which swifts were nesting and the council would use these records to encourage swift-friendly developments when applications for planning permission were made. I used every opportunity to find people who would look out for their local swifts, and now after four summers the network in local towns and villages has grown to over 30 watchers. This smmer I have swift-watching walks organised in half a dozen villages and I hope these will add to our knowledge of swift nesting places and generate more local interest. I also have a stall at village fairs and fetes, and I am confident that new interest will result from a film we are making about the project, which will have its first showing this summer. In all we have established that swifts still breed in about 60 of the 78 towns and villages in the district; we have found more than 130 buildings used by swifts (roughly 400 nesting pairs in all), as well as over 50 places where we know swifts are nesting nearby. For its part the Council has used our data to make recommendations in respect of several planning applications. It has installed swift bricks in a new Sports Centre; added swift nest boxes to its headquarters near Banbury and has plans to provide nest places for swifts in several other new developments in the District. It has also drafted good practice guidelines for Biodiversity in the Built Environment, which will be adopted later this year. 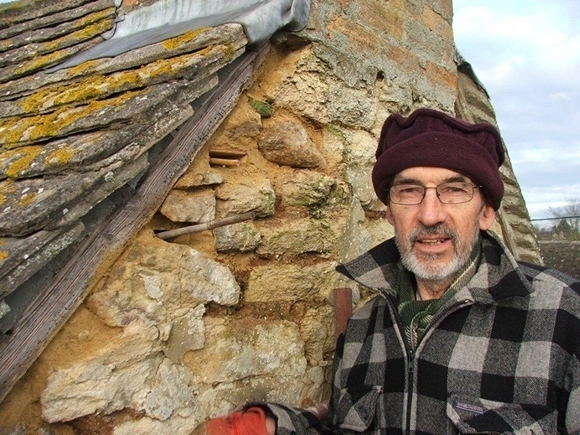 The Cherwell Swifts Conservation Project has a dual approach to swift conservation. The strong link with the Council has meant that we can influence development plans positively to save swifts’ nest places and create new ones; and the network of swift watchers is getting to know where our swifts are and doing its best to look after them. For me the rewards have been great. I’ve learnt a great deal about swifts, and I’ve been inspired by many remarkable people who are doing extraordinary things to help them. I think too that between us all we are encouraging more people to get know and love and care about these wonderful birds.